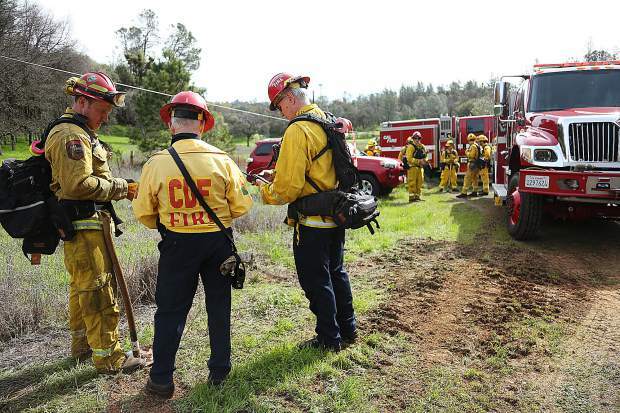 Firefighters confer on their assignment during Sunday's Lake of the Pines multi agency fire preparedness drill. Another fire drill is being planned for May 5 at the Rood Government Center. 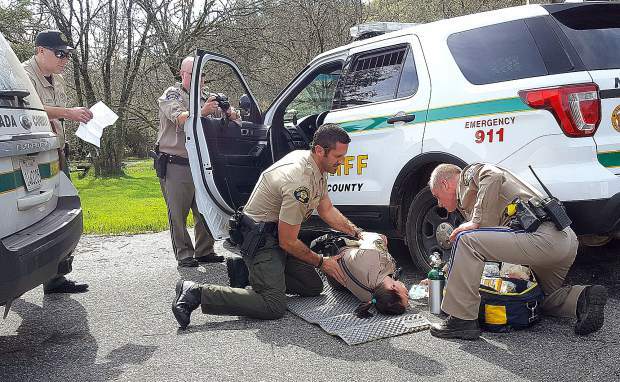 Nevada County Sheriff's Deputy Chris Stanio, left and California Highway Patrol Officer Jason Morgan tend to Deputy Kristin Morgan, portraying an officer who has been critically injured by a gunshot, in a scenario played out during the drill in Lake Wildwood Sunday. Ambulance personnel gather for briefing on their response during Sunday's emergency preparedness fire drill at Lake of the Pines. 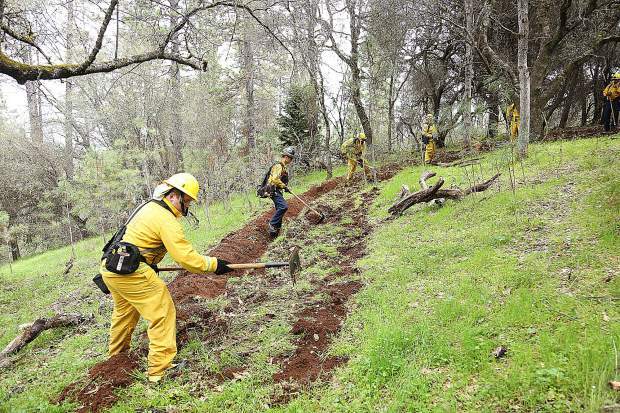 North San Juan, Grass Valley, Truckee, and Cal Fire firefighters work side by side to help cut a fire break line through a meadow during the Lake of the Pines fire drill Sunday. Higgins firefighters prepare to head out from base camp during Sunday's fire drill at Lake of the Pines. 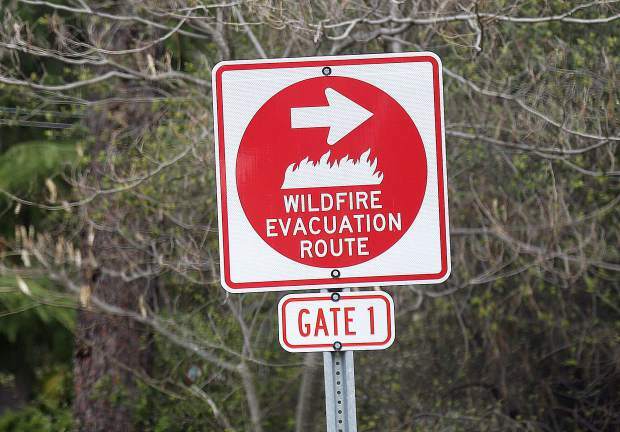 Wildfire evacuation routes are designated throughout the Lake of the Pines gated community. 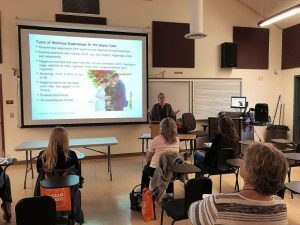 While Lake of the Pines was the location of Sunday's fire drill, future fire drills are being planned including one May 5th at the Rood Government Center in Nevada City. Firefighters from Grass Valley, North San Juan, Truckee and others assemble along Darkhorse Drive during Saturday's Lake of the Pines wildland urban interface fire drill. Regional first responders descended upon Lake of the Pines to learn valuable skills needed during the event of a wildfire evacuation. 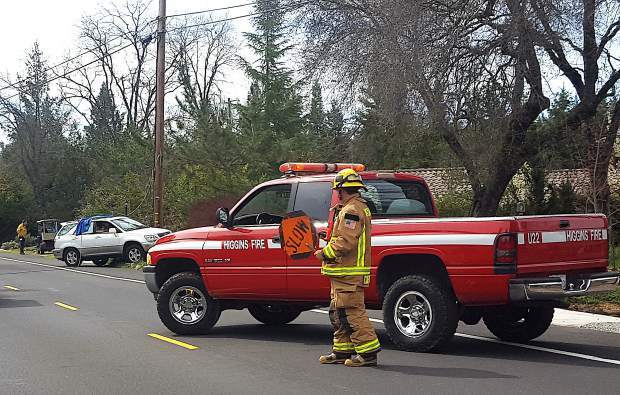 A Higgins Fire Department firefighter slows traffic around the scene of an "accident" where a vehicle has crashed into a power pole and has a possible live wire lying across it, dyring the drill Sunday in Lake of the Pines. 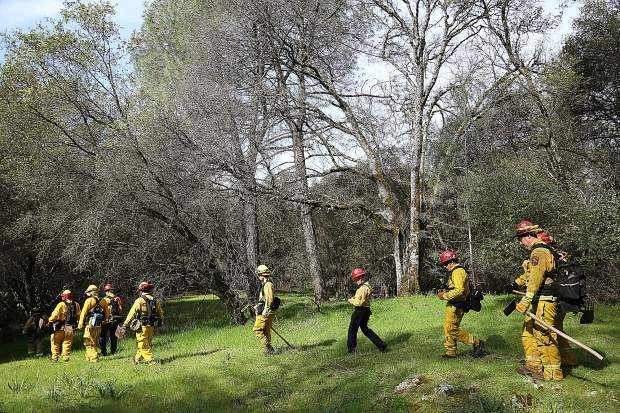 Fire crews were separated into different groups that rotated through the various training scenarios set up in and around the Lake of the Pines community of Nevada County Saturday. Retired Cal Fire Captain Charlie Jakobs talks to a group of firefighters about the importance of deploying fire shelters during Saturday's fire drill at Lake of the Pines. Area firefighters work on their spacing as they walk from an incident during Saturday's Lake of the Pines wildland urban interface fire drill. 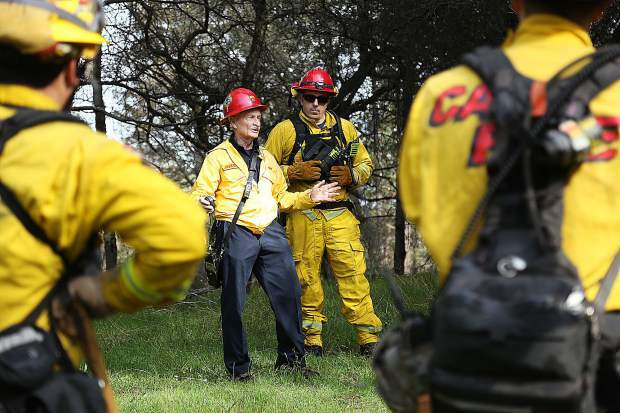 Retired Cal Fire Captain Charlie Jakobs (left) talks to a group of firefighters about the importance of cutting a correct fire line during Saturday's fire drill at Lake of the Pines. 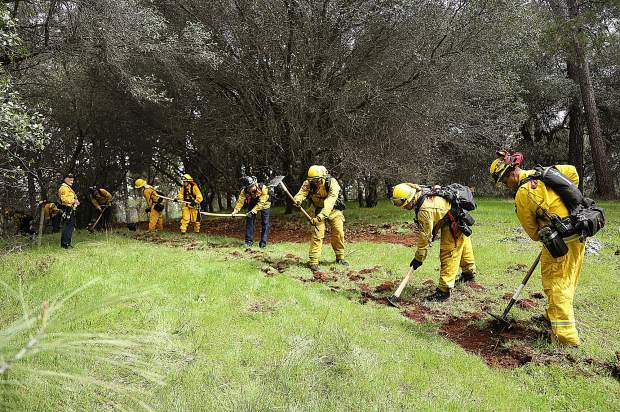 Firefighters work on cutting a fire break line during the Lake of the Pines fire preparedness drill Saturday. 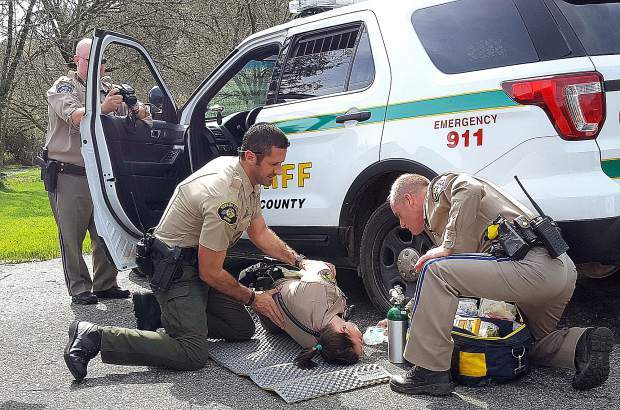 Nevada County Sheriff's Deputy Chris Stanio, left and California Highway Patrol Officer Jason Morgan tend to Deputy Kristin Morgan, portraying an officer who has been critically injured by a gunshot, in a scenario played out during the drill in Lake of the Pines Sunday. CodeRED sends alerts to your mobile device or your landline via text message, phone call, or email if an emergency is happening in your neighborhood. Sign up to receive emergency alerts from your local Nevada County emergency response team. To make sure you receive alerts, register for Code Red notifications at http://www.MyNevadaCounty.com/CodeRed. 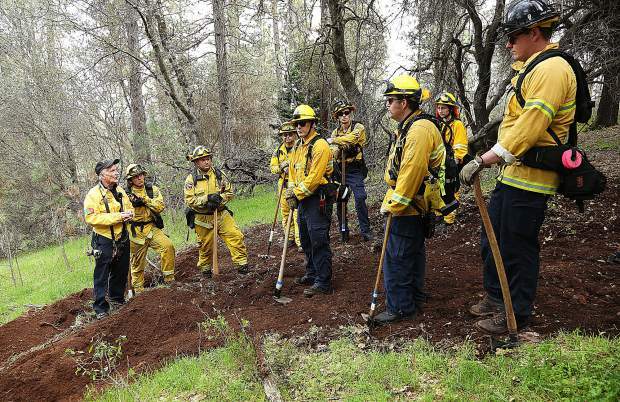 So it’s no surprise that 13 fire departments from Ophir Hill to North San Juan — along with law enforcement officers from the California Highway Patrol, Nevada County Sheriff’s Office and Grass Valley Police, as well as Search and Rescue and ambulance services — were willing to put the time and energy into a day-long “wildland urban interface” drill in Lake of the Pines and DarkHorse Sunday. And so were scores of residents, who volunteered to be evacuated, have their houses hosed down and even play the parts of “victims” in accidents designed to test the system during an emergency such as a fire. It was a sunny and serene Sunday morning in real life at Lake of the Pines. 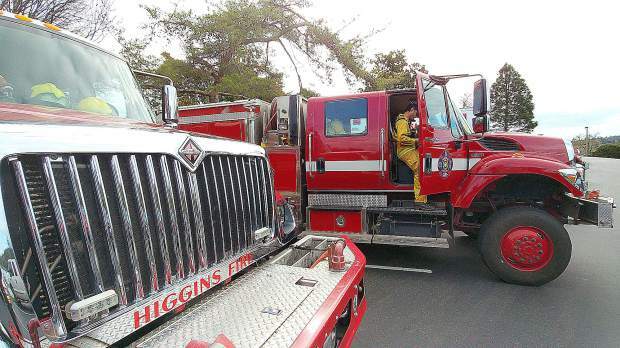 But in drill life, it was Day 3 of a wildland fire that was “just barely” contained at Magnolia and Combie roads, but which was threatening the perimeter of the gated community. Before a CodeRed alert went out, there already was an “accident” just down the road from the clubhouse. Lisa and Steve Bock had “crashed” their Lexus SUV into a power pole after — according to Steve — swerving to avoid a deer. A possibly live wire was draped across the top of the Lexus and the Bocks were instructed to remain inside the SUV until PG&E could be dispatched. 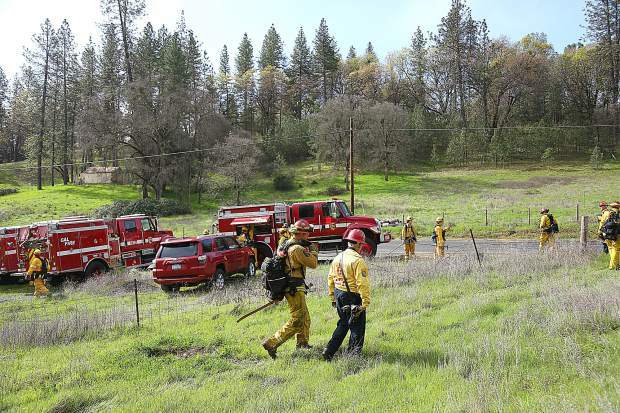 The multi-agency drill hosted by Cal Fire’s Nevada-Yuba-Placer Unit was put together to train firefighters on structure defense tactics including home preparation, hose deployment and crew life safety measures, as well as on road closures and evacuations. 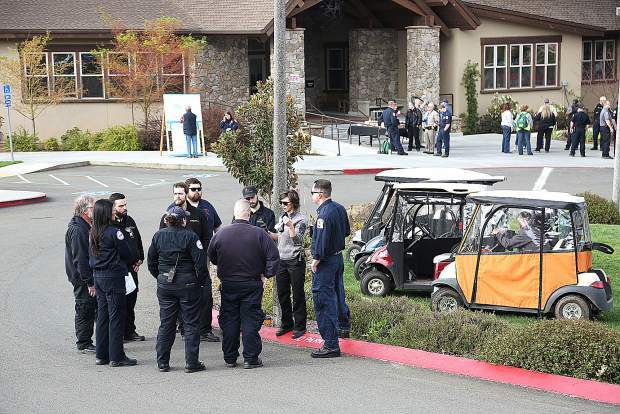 As Peardale-Chicago Park firefighter Daniel Ramey noted, the twisty loops of many Nevada County communities can be confusing even under the best-case scenario. Add in less than favorable conditions and response times get exponentially longer. 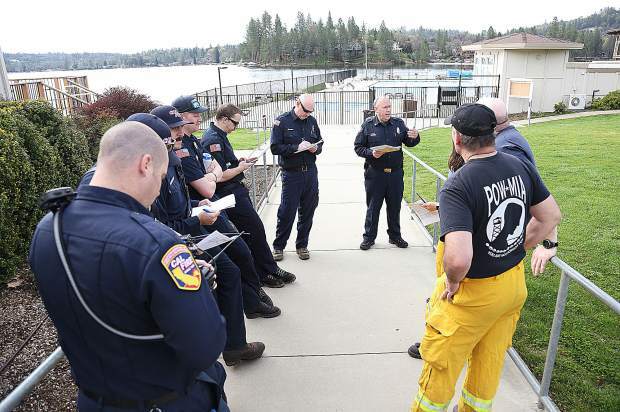 During the drill, firefighters practiced evaluating residences using wildland urban interface placards that help them outline ease of access, amount of defensible space, water source and remaining occupants. If there is time, that preliminary triage of what houses can be saved will help strike teams move more quickly and efficiently, Ramey said. 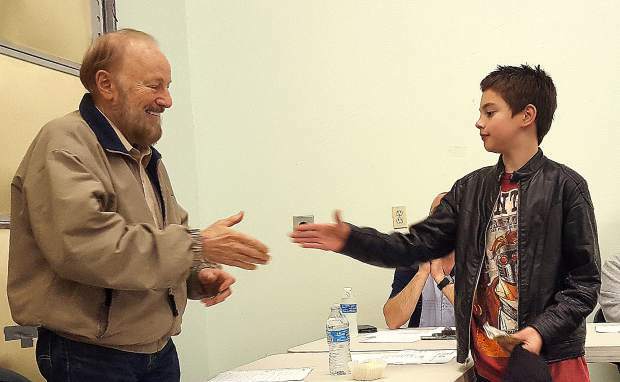 Search and Rescue volunteers worked alongside Sheriff’s deputies to conduct “evacuations,” going door to door on some blocks to check in with residents and urge them to be prepared and sign up for emergency alerts. 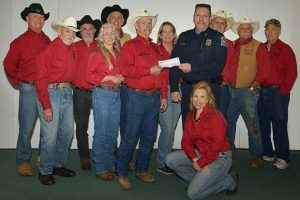 One resident who had no idea there was a drill and did not know about CodeRed was Mike Lewis, who got a visit from Sheriff’s Deputy Joshua Stanis. Down the street, neighbor Tim Crough said his wife was signed up for CodeRed, but the drill served as a good reminder. 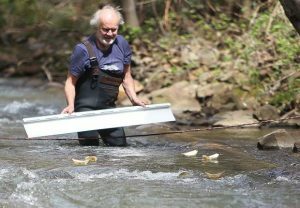 One important component, those participating stressed, was road-testing emergency communications among more than a dozen agencies that all have their own radio frequencies. Contact reporter Liz Kellar at 539-477-4236 or by email at lizk@theunion.com.